A much needed thrifting excursion to get some shopping needs out of the way. Do you ladies and gents ever have a sudden urge to go shopping? And the feeling doesn't go away until you actually purchase something to relieve it? Well, that was the mood I was in this past week since I have not shopped in quite some time. The best remedy? To relieve this feeling by thrifting! It's a great way to shop until you drop without actually putting a dent in your wallet. This was an impromptu trip with a friend after we watched The Veronica Mars Movie (which I absolutely loved, btw - although I may be biased...). It also seems as though I find the greatest treasures when my friend is there to point things out. Always a plus to have a friend around while you thrift, although I normally lone wolf it during these types of trips. None of my buys were absolutely love at first sight type of purchases, but SO WORTH IT still. And, apparently the theme was red during this thrifting adventure... completely unintentional. 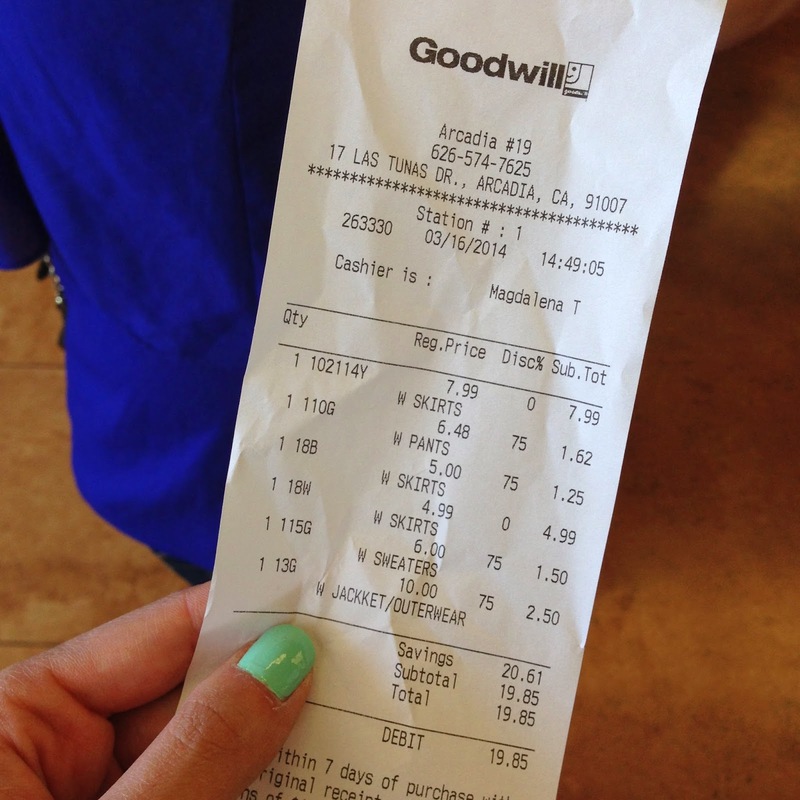 Check out the images below for individual cost, and the receipt to prove it all! I was shocked by the overall price, as well, since they were having a 75% off for some items, which is crazy. Think about already discounted items, with an additional 75% off!? Who does that? Goodwill, my friends.